← Using XTemplates for presenting custom HTML. 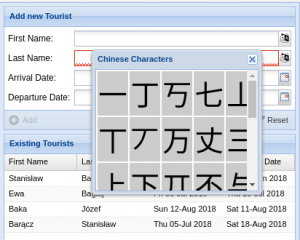 In some cases users have to insert special characters, for example polish alphabet contains some extra letters or umlauts of german alphabet or symbols like a celsius sign “°C”. I have developed this functionality in form of plugin. It inserts a trigger to field which popups the panel with special symbols. The plugin is implmented in two files, the plugin and popup window. The symbols can be listed in as an array or function.